"Post a picture of your mom from her younger days and write a brief personal note to her. It could be anything that you wish to say.. don't worry about things like length, grammar, etc. these mean little to her. Just pour your heart out." I am definitely going to post the personal note for her with her photograph. I really had to do a lot of hard work to get hold of my mother's pre-marriage photos. But I am glad I found some. I wrote the note few days back, on a plain sheet of paper, which goes into my diary today after it has been shared here. I hope my mom finds it someday. I would be asking for too much if I hope that she reads my blog someday, so putting the note in my diary seemed a fair idea. She has always been the lady who would listen to my cribbing when I have lost my favourite of the hair-clips or the direction in life. And of course this lady who would help me find them as well. She is the lady behind all the magic that I see around myself. Starting from having my shirts ironed to finding my favourite delicacy on the dining table after I return back home, each and every magic is because of this lady. I inherit my super emotional nature from her. I inherit my beautiful hair from her. I inherit my grace and dignity from her. I am what I am today because of her. We all know how important our moms are. Starting from finding my breakfast right in front of me in the morning to the good-night kiss, my day is incomplete if I don't find her for a single second when I am home. I might write really good at times, but when it comes to expressing my feelings for people I really love, I just fail. I just fail. This true incarnation of God can never be thanked enough. I love you, Ma! Beautiful, beautiful, beautiful! 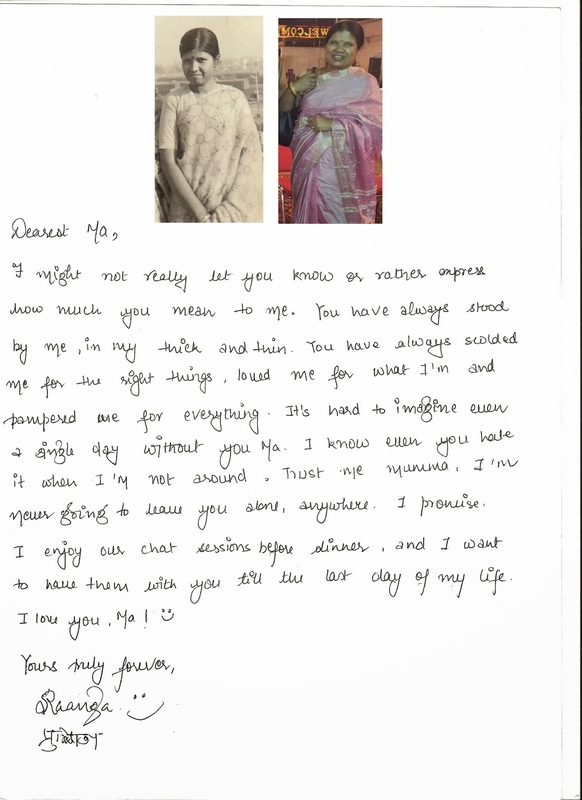 It's a special bond, that connection of the heart... loved the handwritten letter SO much. I too hope the same. Thank you for visiting my blog! First of all, thank you so much for this wonderful topic! It actually touched the soft corner of my heart.